Riding D.C. Circulator can be much more pleasant than riding Metrobus; lower fares, more frequent buses and simple, quick routes. Starting Oct. 3, the buses will drive east of the Anacostia River for the first time. The D.C. Department of Transportation began D.C. Circulator in 2005 as an easy way to get around areas that had a lot of activity. Most of the buses travel in Northwest. 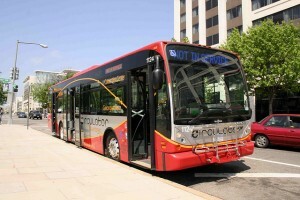 But the Circulator may end up serving other purposes as well in Ward 8, where 20 percent of people earn less than $10,000 a year and the unemployment rate is higher than 20 percent. Fares cost $1, which is 50 cents cheaper than Metrobus. The buses are more reliable, arriving every 10 minutes, and only make three or four stops a mile. The buses are proposed to start at Skyland and arrive at the Harris Teeter and the Potomac Avenue Metro.